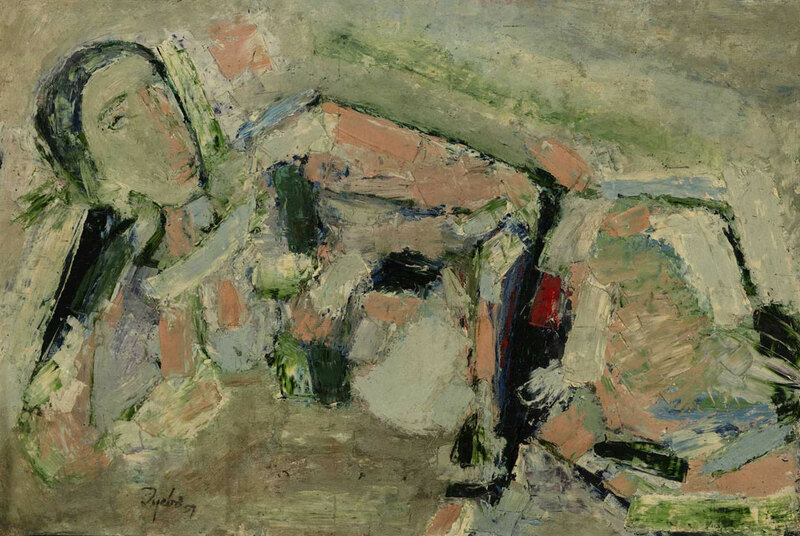 Tyeb Mehta, Untitled, estimated at $100/150,000 is the highlight of the collection. Photo: Sotheby's. NEW YORK, NY.- Sothebys is to offer the Collection of Emanuel Schlesinger in its sale of Indian and South East Asian Art on Wednesday 24 March 2010 in New York. Schlesinger lived in Bombay from 1939 to his death in 1968 and was a patron and major influence over many of the most important Indian artists of the post-war period. Among the many artists he knew and worked with was Tyeb Mehta whose Untitled, estimated at $100/150,000 is the highlight of the collection. Emanuel Schlesinger was born in Yugoslavia but grew up in Vienna. He spent much of his early twenties visiting the museums and galleries of the city and soon became acquainted with many of the leading artists practicing in the city at the time, including Oscar Kokoshka and Egon Schiele. He was also interested in Hinduism and the East. After the Nazi takeover he made arrangements to leave Austria and was heading to Shanghai where there was a small Jewish community, when his boat made a scheduled stop in Bombay. Having been long fascinated by the country he decided to travel in India, but his tour was cut short by the outbreak of war in Europe. During the war Schlesinger was briefly detained in an internment camp and it was during this ordeal that he made the decision to remain in India. Bombay in the 1950s was a place of enormous creativity with a congregation of artists who experimented with new forms of painting and were to become known as the Progressive Artists Group. Many Europeans, including Schlesinger and his friends Walter and Kathe Langhammer, moved to the city around this time and became active in the cities burgeoning art scene, bringing their experience of pre-war European art to these emerging artists. Schlesinger had been forced to leave his art behind when he fled Nazi Europe but he set about the task of rebuilding his collection by buying paintings from many of the emerging artists that make up the collection that is being offered here. A pioneer, he was one of the first people to commission paintings which he would use on calendars, postcards and other promotional material that he would send to Doctors and other clients of his pharmaceutical company. Valencian Institute for Modern Art Opens "From Gaudí to Picasso"
Boulder Museum of Contemporary Art receives 2009 Award of Merit from Historic Boulder, Inc.
Smithsonian's National Numismatic Collection Presents Traveling Exhibition "Good as Gold-America's Double Eagles"